Throughout the world, when discussions turn to East Asia, more often than not the topic that arises first involves Asia’s dynamic economies and the transformations they are triggering within and outside the region. Emerging powerhouses such as China and India, and even Indonesia, are following an earlier generation of economic “miracles” in Japan, South Korea, Taiwan, Hong Kong and Singapore and cementing images in the West of an increasingly prosperous East. Less often discussed, but just as important, is that East Asia has experienced an unprecedented period of peace in recent decades. Since the end of the Sino-Vietnamese war in 1979, the region has seen no major military conflicts of the kind that recurred in the past. In short, East Asia has enjoyed a prolonged period of both peace and prosperity. And yet, security in East Asia cannot be taken for granted. In addition to the obvious flashpoints on the Korean Peninsula and in the Taiwan Strait, there are, from time to time, other reminders — whether a diplomatic spat over disputed islands in the South China Sea or a public outcry over contested versions of history ­— that the demons of conflict are never far below the surface in East Asia, no matter how strongly the region’s economies are growing. Should miscalculation or mismanagement of security relations ever see flashpoints flare into military conflict, the web of economic ties that bind East Asia could fast unravel. In our cover articles, we pose several fundamental questions: What is the relationship between East Asia’s remarkable economic growth and the long peace it has experienced? Has growth made East Asia more secure or has security enabled East Asia to grow? And most important, can both last? There is much at stake in the answers to these questions, not just because the world’s economic center of gravity is shifting steadily from West to East, giving Asian nations a greater voice in global affairs, but also because the rest of the world relies more and more on Asian capital, investment and markets. Gone are the days when the rest of the world could fiddle while Asia burned. Predictably, as our cover articles show, the answers are fraught with complexity and nuance. The articles are based on papers presented at two conferences examining economics, security and international relations in East Asia. The conferences were held in Philadelphia (July 2009) and Beijing (July 2010) and were organized by the Christopher H. Browne Center for International Politics at the University of Pennsylvania, in co-operation with the China Foundation for International and Strategic Studies. 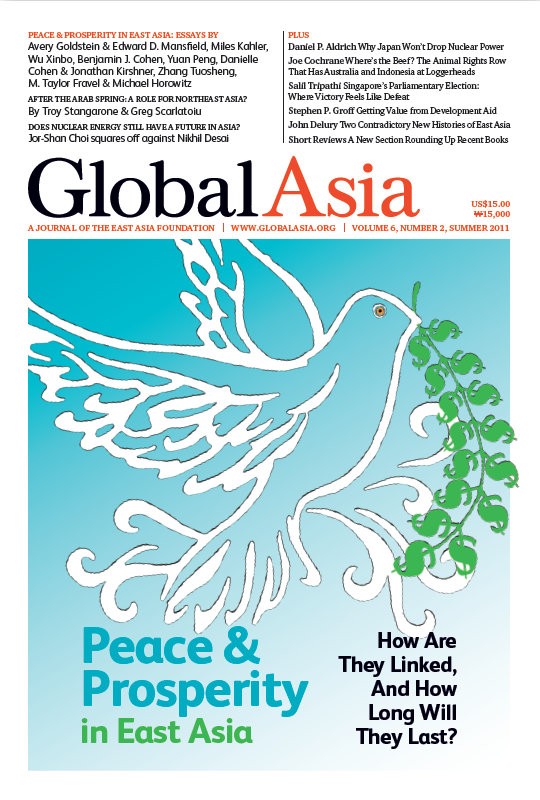 We at Global Asia would like to express our gratitude to Prof. Avery Goldstein, who is Associate Director of the Christopher H. Browne Center and David M. Knott Professor of Global Politics and International Relations at the University of Pennsylvania, for serving as Guest Editor of our cover package. In this issue, we also include, among other pieces, a debate about whether nuclear energy still has a future in Asia after the disaster in Japan. We also examine the likely course of Japan’s own nuclear program. Separately, we are pleased to announce the appointment of John Delury, Assistant Professor at Yonsei University, and Taehwan Kim, Director of the Policy and Research Department at the Korea Foundation, as Global Asia book review editors. Asia’s economic rise in recent decades has been accompanied by an unprecedented period of peace. Many wonder whether economic growth and integration have fueled the peace, or whether the peace has enabled the growth. Most important, many wonder: will both last? In recent years, the People's Liberation Army has increasingly focused on non-combat operations, principally domestic disaster relief and managing internal unrest. East Asia's rapid economic growth and its implications for the rest of the world is a story that has generated extensive analysis and debate. In the past decade, new regional economic institutions in Asia seem to have given the region a head start toward greater security. Since the ASEAN + 3 process involving the 10 members of ASEAN plus Japan, South Korea and China began in 1997, growing regional economic links have had spillover effects on security co-operation, writes Fudan University Professor Wu Xinbo. While much has been written about moves in East Asia toward financial integration, security tensions and the lack of a common identity have made such efforts largely symbolic, argues Benjamin J. Cohen. A complex web of disputes and historical grievances continues to divide the countries of Northeast Asia, despite improvements in relations towards the end of the 20th century. As China's massive and ever-expanding economy claims more and more of the world's energy supplies, international relations experts have increasingly predicted its energy needs will eventually put it in conflict with the United States. Much progress has been made in recent decades to resolve the many territorial disputes that plagued East Asia in the past, although some still remain. The prolonged peace that enabled East Asia to prosper in recent decades saw many countries in the region emerge as world leaders in high technology industries, including information technology. Does Nuclear Energy Still Have a Future in Asia? While some European countries have started rethinking their nuclear programs in the wake of the Fukushima nuclear power plant disaster in Japan, emerging Asian nations are not. The building of nuclear plants in Japan has been in decline for years, and while the industry has pinned its hopes on developing nations’ energy thirst, so many improvements are still needed in safety, regulatory and compliance criteria. Some lay blame for the nuclear plant disaster on 'amakudari' - the cozy relationship between Japanese government regulators and the industries they regulate. Diplomatic disputes over the years between Australia and Indonesia have ranged over a host of contentious issues, many of them involving charges by Australia of human rights abuses by the Indonesian government and military. After the Arab Spring: A Role for Northeast Asia? While the US and Europe have been the most vocal supporters of the reform movements in the Middle East and North Africa, their past behavior in supporting authoritarian governments in the region may make them suspect partners in the transition process. The People's Action Party has ruled Singapore since independence in 1965, with opposition parties barely ever able to dent its stranglehold on the ballot box. The most recent parliamentary elections were no exception. An international forum to be held in Busan, South Korea, later this year will shed light on whether recent global initiatives to increase aid effectiveness are working and how they can be improved. Powered by China's inexorable rise, East Asia is increasingly looked upon as a pillar in a multipolar world.